Nido, design: P. Urquiola, E. Gerotto. Armchair. The Nido series also includes a pouf featuring the same type of cover. Structure: stainless steel. Base in stainless steel with a satin or Ornué finish. Plastic spacers. Upholstery: fixed, hand woven with Rope cord. Set of four cushions: removable upholstery cover available in the fabrics Luz, Rope T or Brio. Note: the particular Ornué finish of the base is made by De Castelli on an exclusivity basis. These cords are produced with Rope yarn and are both used to produce rugs and sewn or hand-woven directly onto the structure of some furniture pieces. Rope Corda 10 is a Paola Lenti's signature material. Colour samples are an indication only and do not replace the use of real samples when ordering, since it is impossible to guarantee a screen reproduction identical to the original. Colour quality depends on the device used to visualize the web site and can vary from device to device. Textures are sometimes zoomed to allow for a better visualization of the materials. Luz fabric offers a high resistance to abrasion, to UV rays, to sea and swimming pool water. The wide range of colours, coordinated to the structures upholstery materials, allow to this fabric to be an ideal fabric for cushions, seats cushions and seat pads of Aqua Collection. Luz is a Paola Lenti's signature fabric. Rope T differs from Rope as it is weaved with braids instead of cords; for this reason, its structure is much lighter and allows many types of executions and stitchings. Rope T fabric is ideal to upholster cushions, seats cushions and seat pads of Aqua Collection. 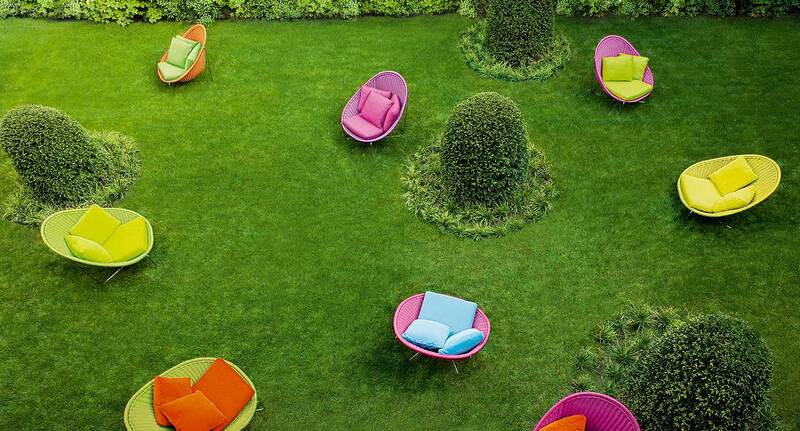 Rope T is a Paola Lenti's signature fabric. This fabric is created by weaving Rope yarn. Its structure allows for the execution of any stitching. Brio is a Paola Lenti's signature fabric. Thea reproduces the classic jacquard weave of indoor fabrics, though updating colours and pattern to become an unprecedented outdoor fabric. Colour samples are an indication only and do not replace the use of real samples when ordering, since it is impossible to guarantee a screen reproduction identical to the original. Colour quality depends on the device used to visualize the web site and can vary from device to device. Project by : Wholehearted & Schrems Garteneinrichtung. Photo by: Ludwig Haidinger. Interior and exterior design CGDesign. Photos by: Jeff Brown. To save products in your catalogue, you have to be registered and logged.